Updated Update: Lisa got more testing done. The results say her initial diagnosis was wrong: it's NOT cancer! She is still very sick, and may eventually need surgery. For a full update on her condition from Lisa herself, check here. Clearly the buttons worked ;) So you can take them down now! But please continue to offer Lisa your support, as she still likely has a rough recovery ahead. Update: Lisa's had a second opinion from a doctor who said the mass in her abdomen may not be cancerous. But we still don't know for sure. She's awaiting more testing. I'll keep you posted. Lisa is a mother, and a wife, and a sister, and a daughter, and an excellent writer, and a great friend, and a good person. She has helped many people, including me, get through dark days. In fact, the very first time she visited my blog, she commented, twice, on this post, to reassure me, after my son was first diagnosed with a sensory disorder, that everything was going to be all right, and she knew it, because her son had struggled with sensory issues too. She offered to talk to me, a complete stranger at the time, over the phone. And then she gave me an entire page's worth of kind and useful advice. Because she's just that kind of awesome. Please feel free to copy this button and put it up on your site to support Lisa. I'd appreciate it if you'd link the button back to this post, so other people can read about Lisa, copy the button, and go visit her site. 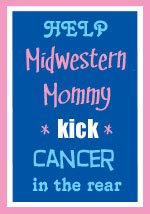 Then remind all of your readers to click through to Midwestern Mommy, and leave a kind comment or send an email showing support. jae, you are one of the best friends i know; lisa is lucky to have you in her corner. Thank you for making the button! I've already added it to my blog! You are the button-tastic queen, baby! We'll get her through this. That's a nice button, I will add it to my site. I've also put in a request to the American Cancer Society to use their trademark on a link to donating to them. You can even donate in Lisa's name. That's an amazing number of sites talking about her! I checked on her site this morning and she had nearly 300 comments in support. What an amazing community. Thanks J for doing this. You rock in all your awesomeness. Thank you for doing this. She is amazing. The story you tell sums her up perfectly. She is kind and loving and warm and smart and beautiful and she has no idea that she is any of these. It's heartwarming to see our community come together for her. Thanks for the linky love. Lisa is a real sweetheart and she's very lucky to have wonderful friends like you! Nice to meet you!! I added you to my list of favorite people and I'll add the button to my blog!! Thanks and Hugs!! Hey, I'll add this to my sidebar right now. I just posted about this and will be adding the button to my sidebar as well. I saw your comment on Midwestern Mommy's blog and clicked over to find out what buttons you were talking about. Then I saw that you mentioned having a child with sensory processing issues. I always get a little excited when I see other parents going through the same thing. So I'm glad I found your blog and I'll be adding both you and Midwestern Mommy to my feed reader.